It’s no secret that when it comes to embracing new and emerging technology, lawyers and law firms are sometimes late to the party. The adoption of social media as part of law firm marketing has been no exception. A number of our own law firm web design clients were wary to test the waters initially with social networks like Facebook. If your firm is setting up your Facebook page for the first time, or reviewing your current presence, take a look at these common mistakes that firms make when it comes to building and maintaining a successful and engaging Facebook presence. Before you create your Facebook Company page or start posting updates, it’s a good idea to put together a social media policy for your firm to follow. This can range from a general outline of overarching guidelines to a list of specifics on who in the firm can post what. If you’re charged with setting up social media for your firm, get input from all stakeholders - including senior partners, IT staff and marketers - as you put together your social media policy. Don’t forget to solicit input from new associates, who are likely to be familiar with the platform and can provide useful insights. As you get started with Facebook, you'll probably have an idea of who in the firm will manage it moving forward. Some firms leave all social media efforts (and content creation or marketing in general) on one person’s shoulders. Today, firms should rely on more than one person for practice development. Facebook usage can - and should - be a team effort. Even if your social media policy dictates that only one person can make actual posts, all attorneys and staff should be encouraged to create content and come up with ideas. 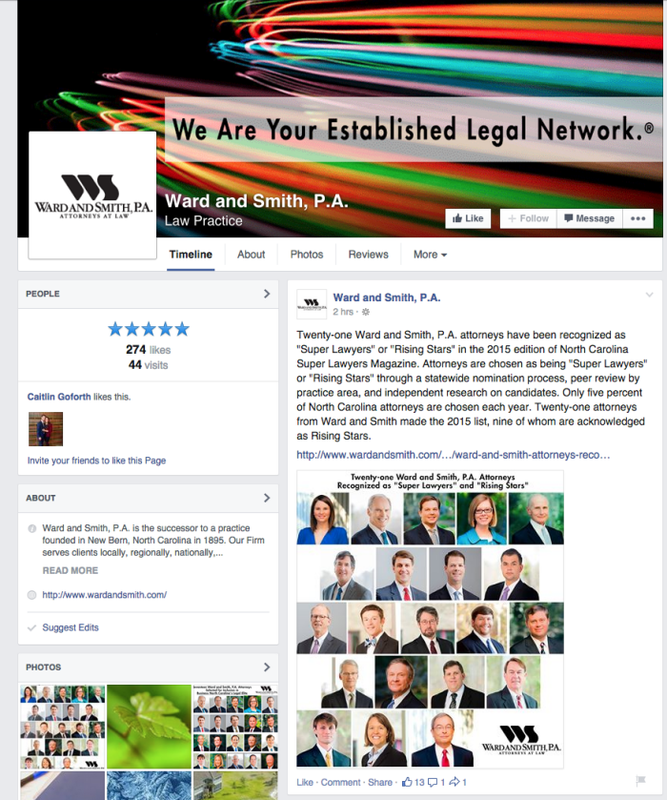 Ask attorneys in the firm to invite their own Facebook friends to 'Like' your Facebook page. This is another area in which new associates and members of Gen Y can be extremely helpful. 3) Neglecting to brand your Facebook Company page. Customize your URL – Once your Page has 25 fans, you can create a custom URL. This means that your page will go from something like https://www.facebook.com/pages/Test/62986293 to https://www.facebook.com/battenleepllc. Design a cover image (the banner image across the top of the page) and profile image (the small images beneath the cover image) so they are both consistent with your law firm branding. Cover images are 851px wide by 315px high. For your profile image, you need to upload an image at least 180px by 180px, but it's displayed at 160px by 160px. Many firms opt to use their logo as their Facebook profile image. Optimize your “About” section – This is the short blurb of text that shows below your profile image on the lefthand side. You get 155 characters to describe your page, and you should be as descriptive and helpful as possible. Creating a Facebook page and never posting anything. If you have a Facebook page, you should be posting updates occasionally. If you don't expect you'll ever make a single post, it's better to stay off the social network than have a page that's blank. Posting “Looking for a Real Estate attorney in Raleigh?? Call us at 555-5555” every Tuesday. As you consider your Facebook strategy, a good rule of thumb is asking yourself, "Is this a page I would want to follow?" If you've never posted a single update, or you only remind your followers of your phone number and practice areas once a week, the answer is probably "no." You can (and should!) post a variety of things to your Facebook page. By following some basic guidelines for post engagement, you can ensure that all your posts - regardless of topic - are appealing and more likely to be commented on, liked or shared. For example, you shouldn’t leave a shared link in your status. When you copy and paste a link into a Facebook update, a preview of that link page displays automatically. Once there's a large call to action to click on inside the page preview, you can delete the actual URL you copied in. This will make the post look much cleaner. Also, posts with photos get 53% more likes, 104% more comments and 84% more click-throughs on links than text-based posts, so it’s a good idea to include an image with your posts if you can. Here are some more interesting Facebook engagement statistics, and Facebook’s Guidelines for Post Engagement with some helpful image dimension specifics. Content marketing - creating and distributing valuable, relevant and consistent content on your website - is a perfect fit for attorneys and law firms. Attorneys are great candidates to be successful at content marketing because they are good writers, they have information that others need and writing content shows off what they know about recent legislation or updates to the law. In addition, indexed and useful posts on a law firm website contribute to the site ranking for a variety of terms in search engines. Take a look at our guide on the value of a blog for a law firm if you haven't considered content marketing. Some firms are hesitant to post links and promote this valuable content from the website on social networks. Marketing managers or attorneys may think a post about a niche legal topic wouldn't interest the general public, and therefore shouldn't be posted to social media. Facebook is the perfect place to promote this content to drive leads back to the website, and should not be overlooked. While it's important to use Facebook as an avenue to promote your own content and recent firm news, many firms spend 100% of their time on social media doing just that. Facebook is about building relationships, so it's just as important to listen as it is to broadcast information about yourself. Along with their own content, firms that are successful on Facebook typically ask questions or solicit feedback, comment on other posts to promote conversation, share statuses from other Facebook pages and post industry-relevant resources that were not written by someone in the firm. You can also vary the types of content you post about your own firm. Does the firm sponsor a charity event, or ring the Salvation Army bell for a day? Did an associate recently get married? Those are great topics for Facebook posts that add character and warmth to your brand and may bring in more engagement than a typical news post. It's also great to post pictures from events or seminars, or even root for the local hometown sports team. 9) Not being flexible with new Facebook features. Facebook is constantly rolling new features to make Facebook Company pages better and more useful. Firms will sometimes pass up on using or implementing these features because they're unsure what they do or how they work. For example, Facebook rolled out ratings and reviews for company pages about a year ago. Firms should utilize this feature by encouraging Facebook fans and clients to leave a review for the firm. 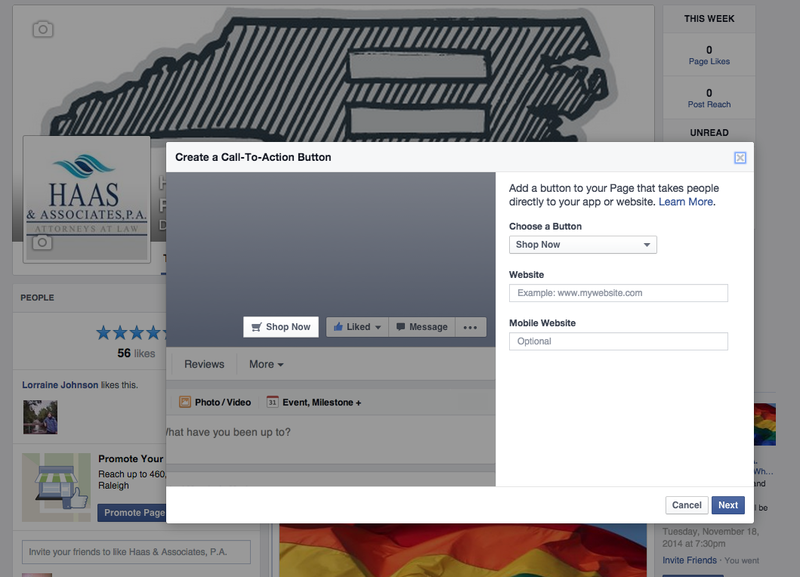 More recently, Facebook has added a 'call-to-action' button on company pages. You can use this feature to encourage Facebook fans to subscribe to your newsletter or contact the firm. Facebook advertising is also a great way to reach people. Facebook ads can be a cost-friendly way to quickly expand your audience and increase the reach of your Facebook posts, and you can hone in your target audience and filter your ads by things like location, age, demographics or interests. 10) Limiting your social media to Facebook. While Facebook is by far the most popular of the social networks, it's a great idea to establish a presence across the big four - Facebook, Twitter, LinkedIn, and Google+ Local. The latter is especially important when it comes to Local SEO - optimizing your web presence so your firm is found on Google searches with local intent (such as 'litigation attorney in Wilmington, NC.') Learn more about Local SEO Tips for Businesses from the NMC blog. 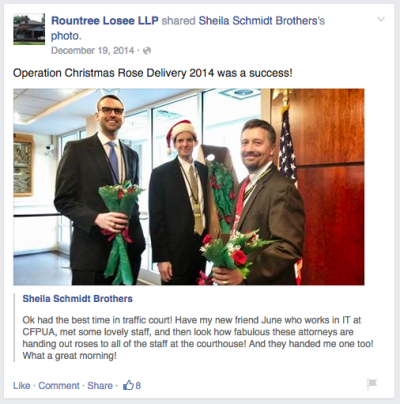 What are some other ways that law firms can better take advantage of Facebook? I'd love to hear what I missed! Need help with setting up your firm's social media presence or creating content for the website? We're here to help! Learn more about New Media Campaigns' online marketing services. That's cool "Engaging with negative comments online". I think this is very unique and powerful technique to get traffics. I believe Social Media Marketing goes hand in hand with any marketing strategy, anyways kudos for this post! Great and amazing article about social media promotion. We should take care about these mistakes as a law firm.